Please note that this is an archived post. Here, we describe the 1st edition of our Over/Under ‘X’ Goals Betting Course. We decided not to remove this post from the site because of the many questions and answers in the comments section. For those of you with curious minds it may also be quite interesting to see how this product has developed over the years. 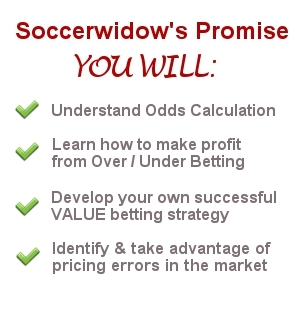 Soccerwidow’s Over Under Betting Course takes the bettor through probabilities, odds, value, profit and loss calculation, and explains these technical terms in easy language. There are plenty of exercises to help hone your skills, and you will also learn to download historical data and analyse it using calculation software such as Excel. The course explains in detail how to evaluate teams and compile your own ‘true’ odds for the Over Under betting market which can then be compared to the market prices. You will be taught the process of calculating value, clustering data, understanding probabilities, and computing potential profit and loss from anticipated bets. This book is essential reading for anyone looking to understand odds calculation and take their betting to another level. Why do I need to know how to calculate odds? Enthusiasm for sports betting is good and fine, but there is much more needed to actually become a winner. The majority of bettors use their hearts, gut feelings, and hunches to place their bets. They then perhaps do a little research and despite getting the best odds available in the markets, and using various bookmaker accounts, they wonder why they lose more than they win in the long run. The answer is simple; to make a regular profit and keep on winning not only requires a disciplined approach but also a thorough understanding of odds calculation. What knowledge is required to understand this course? This is a beginner’s course, and aiming at people with little odds calculation knowledge and basic Excel skills. The course is written on a level which does not require higher maths than O-levels. Still, the course may be quite difficult for those who have always found maths a challenge. Just take your time, read each chapter several times, solve all the exercises before moving on to the next section, and try to understand everything. Ultimately, you will be rewarded with knowledge. To ensure proper understanding, the course contains no shortcuts. All calculations need to be done manually. There are plenty of exercises to guide the learning process and the aim is that once you master the course, you should be able to develop your own betting system which should hopefully turn you into a winner. All formulas are given and explained either in the chapter of each exercise, or at the end which contains the solutions to all of the exercises. You are welcome to ask specific questions via the comment functions in any article on the Soccerwidow website; we usually reply within a few hours and are more than happy to help. transferrable to other football leagues? Absolutely – although the course uses the German Bundesliga as its example to outline principles and techniques to analyse a league’s goal distribution, the methodology is equally applicable to any world football league and indeed, relevant to all other professional sports. Furthermore, the Odds Calculation Course uses the Over Under Goals market as its theme and the approaches demonstrated are timeless, using fundamental statistical principles for practical football betting applications. They are also usable for odds calculation in other betting markets (e.g. both teams to score, clean sheets, etc.). Anything with historical data available and which is countable can be statistically analysed. Once the distributions are known, forecasts and projections for the future are possible. Sorry, but the first edition is not offered for sale anymore. It helped many, many people see gambling in a different light. It was praised as presenting facts in an unemotional manner, stripping away the myths and false beliefs hampering the majority of punters. The book has undergone a transformation to become a complete guide to betting for long-term profit, including everything customers of the first edition asked, either by commenting here on this page (see below), or by contacting us directly by email. 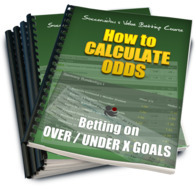 My advice would be to purchase Soccerwidow’s ‘How to calculate Odds’ workbook. but as I bet on both soccer & Australian Rules Football I found it invaluable. I can’t wait for your next article. Exercise 1.2 Part E is not clear at all how you arrive at your results and your answer to people asking for help is to spend another £40 to get an explanation. Well no thanks it should have been written properly in the first place. No need to spend another £40 to get the explanation for exercise 1.2 (E) in the old course. Sorry for this challenge, you are not the first, but I am sure that you will master this exercise! I have addressed this question (and many more) in the updated version (2nd edition) of the course in great length. This new course is probably twice as long if not even longer, than the first edition. Anyway, should you decide that you don’t want to purchase the second edition, I have emailed to you the spreadsheet which contains all calculations to come up with the charts used in the course you purchased. Hopefully, this will help you to get to the correct answer in 1.2. (E). Thank you for your interest in the upgrade of the course. The email with the discount code for existing buyers has not yet gone out. The course has only been ready for publishing two days ago. Sorry! However, I’m going to email you the code so that you can use it straight away. Hi, when is the new course going to be published? Also can the odds be calculated for over 1.5 and over 2.5 using this course. And will the course help in anyway taking value in play? Does the course provide access to data to calculate odds? To answer your question, yes the odds for over 1.5 and over 2.5 can be calculated using this course. In regards of taking value in play the course will also be helpful as you can apply the knowledge of calculating probabilities to both, half time and full time goal market. Then you can chose, for example, the matches with a high probability to score during the first half. These matches you can back, say O 2.5 goals before kick-off, and lay them as soon as the first goal has been scored. I’m going to address this in more detail in an article to follow. The odds you used to get Home/Away quotient is opening odds of bookmakers or the odds after adjusting to market buy and sell? I get different results of cluster selections most of the time, switching from opening odds to current odds. The course uses football-data.co.uk data. The odds are taken on Friday evenings before the weekend games, and on Monday evenings for the week days. My approach is to have plenty of time to do all the calculations and make decisions, and totally remove the need to sit in front of the computer just before a game starts. There are families and lots of other nice things to do than to spend the time in front of a computer on a Saturday or Sunday. Anyway, if you wish to use opening odds then you would have to adjust the tables accordingly. However, even if the clusters move slightly, it shouldn’t be too much of a movement because odds don’t change so much that they effect the HO/AO quotient massively. To play it safe for moving odds you can always use 2 adjoining clusters when calculating odds. I was introduced to the term “value bet” some time ago but I always had some problems understanding why trade out if I had that mathematical advantage already…and maybe I don’t have that “magical skill” that makes you know during a match if it is better to trade out or not. I have to admit that although betting on over / under goals is not really my 'game', the stuff you describe in your e-book is revolutionary and of great value to the average punter like me. The task therefore for me is to accurately calculate the fair probabilities on football matches, so I can back the overpriced odds or lay the under-priced ones. Great to see someone has put together a course on the maths and statistical side of betting. It is something I have looked for before but never managed to find anything (not that looked of decent quality anyway! ), so it was refreshing to find your site as some of your articles related to exactly the sort of info I was looking for.